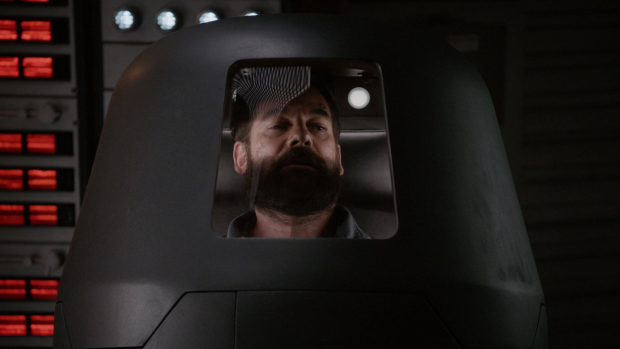 Marvel’s Agents of SHIELD accelerates the incoming threat when aliens place the Lighthouse under siege forcing the team to fight back with limited resources. There are less than a handful of episodes left this season -possibly of the entire series- and there’s still so much ground to cover. The Earth still needs to be either saved or destroyed, an alien invasion needs to be thwarted and answers have to be delivered on whether Coulson lives or dies. This episode picks up from last week with the fallout of Elena’s actions. Killing Ruby was a complex decision for her as there were a lot of things motivating it. Elena tries to justify it by pointing out that taking it upon herself to end Ruby’s life might be the thing that allows the world to be saved but all everyone else sees is an action driven by revenge. I suspect the truth is somewhat in between but what this does is create some internal unrest at a crucial point in the season. At the point where everyone really needs to be on the same page and working towards a common goal this action divides them and creates a situation where they are at less than their best. Mack is the worst affected by Elena’s actions and threatens to walk away from their relationship because she has crossed the line as far as he’s concerned. Henry Simmons’ delivery of the line “that’s not what we do” encapsulates the disappointment and disgust he feels. Elena accuses him of looking at her differently after her issue and reiterates her desire to alter the future by any mean’s necessary. Her conversation with her future self has stuck with her and made her feel like it’s her responsibility to alter the future. This mindset means that her focus is entirely on the big picture making no sacrifice too small or any action too extreme because she believes that it’s in service of the greater good. It’s a position that can be understood even if it’s not something to agree with and it causes a rift between her and Mack because this dispassionate way of thinking is counter to everything he stands for. Arguments like this are a good reminder that these larger than life events are populated by people who have to weather them. Mack has always been the grounded member of the team who struggles to handle the larger scale comic book elements that the show often plays with. The writers have done a great job keeping this conflict grounded on the characters and how they react to the situation they are presented with. It says a lot about how well they have been developed when the potential end of Mack and Elena’s relationship almost seems more significant than the end of the world; if not more significant then it is definitely more immediate. Thankfully Coulson is back in charge because he is able to put a stop to the internal bickering that is going on. Even Daisy is distracted by her feelings about Elena’s actions to the point that she is unable to focus on the task at hand. 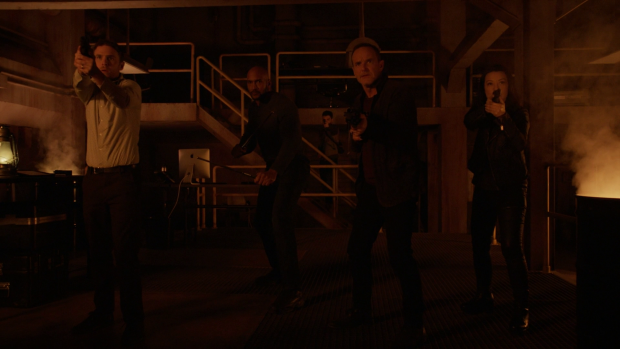 Coulson is able to stop the discussion and bring them back on task at least for the moment. He does so when he remembers the device that was used to escape Hale’s facility being a way to sneak into a base on lockdown. The resulting situation is like something straight out of Alien with dark claustrophobic corridors, an unseen threat and the constant sense of dread hanging over the events of the episode. The aliens themselves look menacing enough and have the near invincible threat advantage going for them. Having the team separated by the lockdown protocol adds to the tension as they can’t rely on strength in numbers against a threat that can easily divide and conquer. A lot of time is spent preparing for the alien attack which makes it all the more tense because it’s unclear when it will come and what direction they will attack from. All of the characters are on edge and the situation seems more hopeless the longer it goes on. As always the team react bravely and prepare for the onslaught as best they can but it’s clear that the odds are against them and that survival is an unlikely prospect especially with Daisy unable to protect them due to being away on her own mission. Fitz and Simmons are forced to break their pledge to never leave each other’s side because their skills are needed in different locations but there’s some reassurance to be gained from the fact that they still believe that they are invincible on some level. The latest theory is that a successful change in the timeline would render Deke erased from existence. There’s a brief and frantic discussion about the multiverse theory vs. the single timeline idea with Deke firmly on the side of the multiverse because that means he survives no matter what choices are made. Fitz suggests that his role is akin to a canary down a mine as to him success means that he disappears but failure has him remain. Ultimately Deke is motivated by fear of non-existence. He really enjoys being in a world with sunlight and other pleasures that he has never experienced so is motivated to save the world in a way that lets him remain. As yet there are no answers on how time travel really works so the stakes are as real as they ever were. 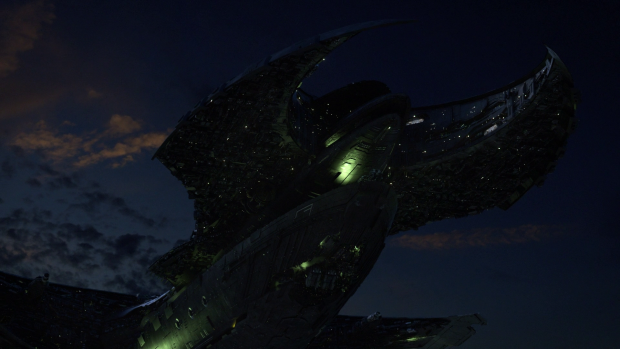 The aliens themselves are a great antagonist with some really cool features. Their localised EMP creating darkness that allows them to move around unnoticed as they slowly close in on the team is really effective and the claws are an easily visceral addition that makes them a really significant threat with the potential to create a large body count. The fact that they only manage to kill characters that were -as far as I can tell- only introduced in this episode lessens the threat value somewhat as the show fails to make their presence meaningful by having them do any real damage to the team. Their presence does allow for a surprising plot development. A crazed Talbot struggling with his programming stumbles onto the infusion chamber and decides that it’s the key to solving the problem so he cranks it up and infuses himself with 100% of the Gravitonium -or 92% of it considering Ruby got 8% of it- giving himself gravity based powers. This clarifies Robin’s drawing of a man with small people inside of him as presumably Talbot has absorbed the consciousness of both Dr. Franklin Hall and Ian Quinn along with the Gravitonium. I enjoyed this twist even though it seems to disprove my theories about part of the finale being a fight between two Gravitons with the team in the middle and the Earth at stake. Talbot’s a reasonable choice to become Graviton given that he is looking for redemption, struggling to collect his thoughts and had no purpose before this. The effort put into establishing the threat represented by the aliens really pays off with the reveal of Talbot as Graviton as it allows the audience to see just how powerful Talbot has become and the threat he now represents considering his mental state isn’t exactly all that stable at this point. For those keeping track this adds another candidate to destroy the world. Ruby has been removed from consideration now that she’s dead and it now looks unlikely that Daisy will be the one responsible because there’s no Gravitonium left to give her abilities an Apocalyptic upgrade so this really just leaves Talbot unless Franklin Hall and/or Ian Quinn can somehow appear once again. I suspect what will happen now is that his mental state will deteriorate further with the H.Y.D.R.A. programming as well as the voices of Franklin Hall and Ian Quinn further confusing him to the point that his powers become uncontrollable. We saw how powerful Ruby was with only 8% of the Gravitonium in her system so Talbot with 92% of it likely has more than enough power to crack the Earth apart. At this point Talbot is still an ally of the team shown by him using his abilities to save them but there’s still time for that to go the other way. No matter what the finale will still be the final -hopefully not- Earth shattering confrontation between the team and whatever is responsible for the end of the world. It’s exciting and building nicely. Daisy’s solo mission is the most underwhelming part of the episode mostly because there isn’t much to it. It felt like a forced attempt to remove her from the lockdown situation due to how useful her powers would be. 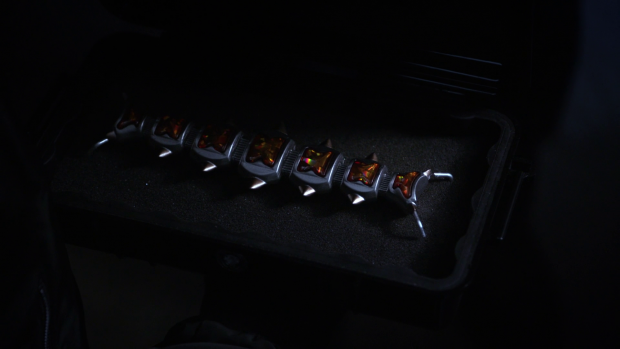 She does reconnect with Tony aka Candyman who gives her the last remaining Centipede Serum from way back in season 1 because it might be the key to saving Coulson. There are a few problems with this idea even though it stands a better than average chance of working. Coulson made it very clear that he has made his peace with the fact that his days are numbered and doesn’t want to go through the emotional horror of being resurrected once again so I can’t see him being willing to accept the known side effects that are known to be connected to this serum. There is a crucial element of it missing that Tony couldn’t find but Daisy recognises it and goes to dig up her mother’s grave which is just twisted on all sorts of levels but also makes sense given her ability to heal and the final ingredient being some sort of healing component. This shows that Daisy is willing to cross all sorts of ethical lines in order to save Coulson as well as cause herself lots of emotional distress by dealing with unearthing her own mother’s body. How this will play out is unknown but my expectation is that Coulson will not be happy with what she has decided to do. This episode also brings an unexpected and really subtle reference to Avengers: Infinity War when Tony mentions something that his happening in New York. I have no idea if the events of that film will impact this show in any way though they probably should. To say more would be a spoiler and it’s still too soon to discuss that film in any detail but you can find my spoiler free review here and a spoiler free hot take podcast here. Another strong episode in a season that goes from strength to strength. The alien threat is appropriately menacing and helps to build tension effectively across the episode. 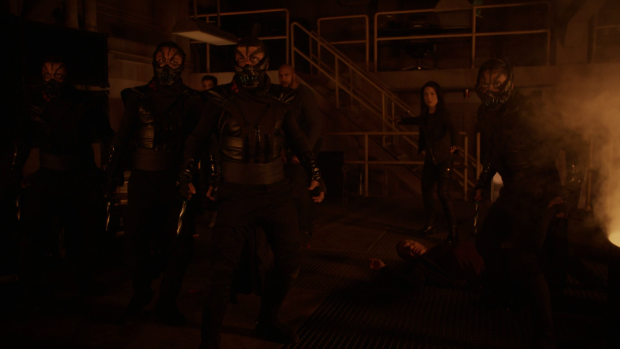 Having the team separated by an unexpected lockdown protocol adds to the tension and the ability to create darkness everywhere they go builds the horror element nicely. Deke’s desire to survive and his hope that the multiverse theory is the correct one as it means that the timeline can be changed and he gets to stay on an Earth with sunlight and other pleasures. Fitz suggests that changing the timeline might result in him being erased if there’s a single timeline. There are no answers as yet so it’s unclear if the actions of the characters are heading for something inevitable or if things can be altered. The reaction to Elena’s actions in the previous episode create some fascinating internal conflicts within the team. Elena and Mack’s contribution to the episode is the most compelling as he is disgusted by her actions and ready to walk away from the relationship. Her perspective is more or less confined to the bigger picture and she is willing to do what it takes to change the timeline but this is against everything that Mack stands for so there is a noticeable rift between them that grounds the larger than life plotting with something more Human. Talbot becoming Graviton is a nice surprise and makes sense in the context of his personal issues. It adds another candidate to the list of potential world killers and certainly creates an interesting angle to be explored with Talbot’s fragile mental state and the issues that having the warring consciousnesses of Franklin Hall and Ian Quinn inside his already unstable mind can create. For now he seems to be on the side of the team as shown by him dispatching the aliens in a way that cleverly shows how powerful he is but there’s plenty of scope for this to change. 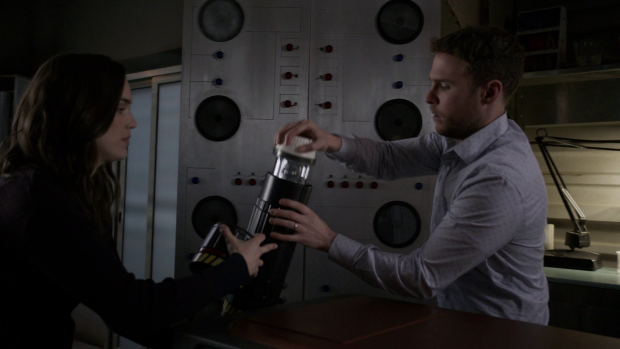 Daisy’s contribution to the episode was underwhelming as there wasn’t much to it but the re-emergence of the Centipede Serum and the potential issues this will create between her and Coulson are fascinating to contemplate as Coulson has made it abundantly clear that he has accepted that his days are numbered. Having her dig up her mother’s grave is a brutal step for her and I look forward to seeing that emotional upheaval that creates.